RANCHO MIRAGE, Calif. - Never let it be said that Pete Dye doesn't have a sense of humor. Charged with creating a pure resort golf course - "a Pete Dye without the steroids," as Mission Hills Director of Golf Ryan Wilson puts it - the notorious hacker-tormentor sinks his teeth into the resort-course format itself. As satirists go, Jon Stewart has nothing on Mr. Dye. Pete Dye gives you resort course fountains, if not always resort pushover holes, on Pete Dye Resort Course. The trademark railroad ties and pot bunkers are visible throughout this Pete Dye course. The ruthlessly hacker crushing holes are not. 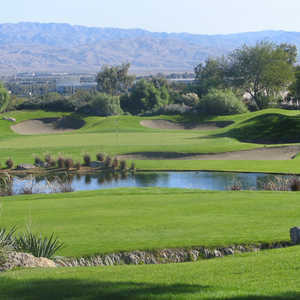 At Westin Mission Hills Golf Resort & Spa Pete Dye Resort Course in Rancho Mirage, Dye very much keeps the resort player in mind. It is still target golf when you get closer to the greens, but it's not impossible target golf. Maybe Dye was simply making the best of his space when he placed the back black tees on No. 4 across the street from the fairway at the Mission Hills Pete Dye Resort Course. Maybe. But there sure is something delicious about the idea of shooting across the street, sending golf balls screaming over the slow-moving Buicks and Lincolns of the resort community. To think, most golf-course homeowners are worried about getting their house dinged. Pete Dye sets up hackers to shoot at their moving cars! Now, that's funny. It's just one of the ways the designer stamps the Pete Dye Resort Course with his ingenuity while keeping it resort-player friendly. Its slope rating is a very Dye-lite 126 from the gold tees that most people play it from, and it measures a modern modest 6,706 yards from the tips. It's not the most challenging or entertaining Pete Dye you're going to play - it's not even in the top 50 - but it's still more challenging and entertaining than most courses. 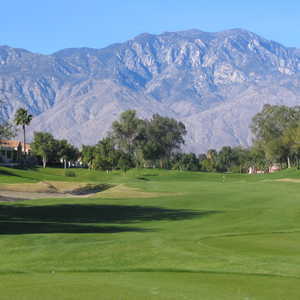 In a Palm Springs valley seemingly filled with Pete Dye designs, you can be sure the Pete Dye Resort Course is going to be one of the best-conditioned of all. 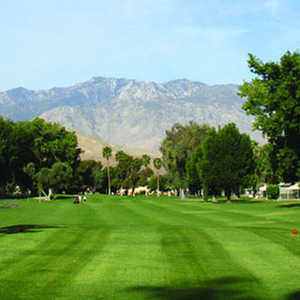 On this Palm Springs visit, it was much greener than Dye's famed PGA West TPC Stadium. Still, the conditions-obsessed Mission Hills staff lamented that the Pete Dye Resort Course wasn't exactly as super, super green as its across-the-street sister, Gary Player Signature Course. Maybe a turf scientist would quibble. But golfers are going to be happy with lies that can help keep them from landing below some of Dye's abrupt hills and swales. Yes, all the Dye signatures are here, like triangles stuffed into the square pegs of a resort course. Sometimes this Pete Dye Resort Course comes across like a Frankenstein creation. You can almost sense where Dye held himself back a little for the sake of the resort guest who hasn't played all winter and suddenly finds himself on the first tee. But then, that may be the best thing about this course: Dye winks an eye at resort courses, has a little fun with them. He puts not one but two of the rote-resort-eye-candy shooting fountains on No. 5, right off the tees - even gives you the option to skirt the flying water. Dye sets it up like it's going to be a nice, relaxed shooting-fountain kind of hole - then you're off on a 541-yard journey to a green so tucked away by a ridge that you can't see the flag until you're almost on top of it. Yeah, just another easy resort par 5. Dye also manages to make some of the most densely house-lined holes the most beautiful. He frames No. 8's green so that the mountains on the horizon seem to be engulfing it. This is a 197-yard par 3 where the low-lying houses are practically close enough to touch off the tee. This would be a truly beautiful hole without all the houses cramping things, but I'll find a way to make it beautiful anyways, Dye seems to be saying. At least, that's what you hope he's saying. Of course, when you get to the ninth tee and two guys are sitting on the low wall by their house, chatting, your mountain wonder quickly disappears. The satirist in Pete Dye would probably get a chuckle from that. Sometimes he just seems to be letting things fly at the Pete Dye Resort Course. For example, No. 8 also includes those Pete Dye railroad ties. No apparent reason, except that it's a Pete Dye and people will be disappointed if they don't see a few railroad ties. If you can't poke a little fun at yourself too, what's the point? For all the fun Pete Dye has with the Pete Dye Resort Course (which includes going more low-key in title than the Gary Player Signature Course), this is still a track that can leave you muttering a few times. "I've never used the 60-degree wedge so much in my life," said Derek Baker of Los Angeles. Yes, Dye will still make you work through a few undulating fairways and awkward lies. With nine par 4s over 400 yards, the Pete Dye Resort Course will give you everything you can handle. Sometimes, perhaps, more than you want. "Gary Player seems to keep the average player in mind more," said Winnipeg golfer Eileen Pennycook said. Of course, there's always the bright side. "This isn't desert golf," Wilson said, noting the green everywhere. "If you hit a bad shot, in all likelihood you're going to be in the grass, in somebody's backyard, out of bounds or in the water." It's all fun at Pete Dye Resort Course, forced carries over cars included. For a quick, tasty post-round lunch, Sub King in a nearby strip mall is hard to beat. The pastrami sandwich is the best thing on the board and it's easy to come away with lunch for two for under $12. You can find pretty much all the usual chain/fast-food suspects nearby as well. But the place to go for a taste of your home in Palm Springs is The River shopping center. This cookie-cutter outdoor mall on Bob Hope Drive has a unique setup, centered on an artificial stream. When the weather's good people often sit outside along "The River" to eat. If you've ever seen a real river you won't be wowed, but remember - this is the desert. Water's a big deal here. More universally impressive is the list of draft beers - a few pages strong - at Yard House ((760) 779-1415). This sports bar/decent restaurant is the class of The River center. The affiliated Westin Mission Hills Resort is across the highway from Gary Player Signature Course and right next to the Pete Dye Signature Course. Mission Hills Resort offers the Westin Heavenly Beds and tall ceilings that are a large plus. Mission Hills isn't as huge as some of the mega-resorts in terms of restaurant choices and pool size, but the small rushing waterfalls add a nice touch. The resort has nice walking paths, but unlike some of the giants, it's not a place where you're going to get lost very often. Parking is free, but finding an open spot close to your room is very hit and miss. Gary Player's was actually the first course at the resort in 1991, with the Pete Dye not getting in until 1997.